Gameplay and design is perfect. Tracks, characters, and vehicles are all very well made. This is Kart Racing, and that is exactly what we will get. Say goodbye to anything else like motorcycles, cars with two drivers, or anything that distracts us from the real focus of the game, which is racing. Good use of the two available screens. While racing in the top screen, the bottom screen displays items you and your opponents carry, an overhead view of the track, and other useful information which easily gives you a view of the overall situation. Best of all, Wi-Fi Connectivity which allows for online multiplayer options. This is the feature that gave Mario Kart DS a solid reputation. Being one of the first to make full use of Wi-Fi Connectivity, Mario Kart DS was an instant hit. Players can now race their karts worldwide. Mario Kart DS is pure kart racing fun. And what’s even better is it’s handheld. 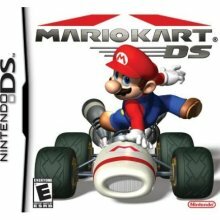 If you’ve enjoyed the arcade or console versions and think that you’ve seen all there is to it, give Mario Kart DS a try and experience what others have already been enjoying for quite some time now.